We can offer you en-suite accommodation for up to 6 people in two bedrooms, each featuring a large shower, toilet, bidet, wash-basin, hairdryer. The rooms, with their tasteful colors and décor, are embellished with old furniture restored by Paola and Alberto, and offer, from their private terrace, a wide view overlooking Lake Maggiore or the mountain scenery of Val Grande. The ORTENSIA room spacious and bright, with wood beams and a part of the old wall in Baveno pink granite has a wonderful lake view and is equipped with a double bed (or, on request, two single beds) and a sofa that if needed can be transformed into a comfortable double bed (140×190) so it is ideal to comfortably accommodate 3-4 people. 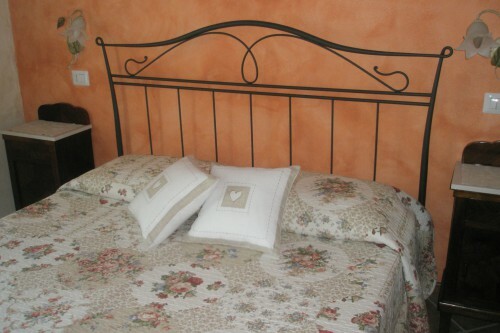 The Camelia Room, romantic and cozy, with wood beams, has a double bed and is located on the north side of the house with views of the mountains of the nearby Val Grande. 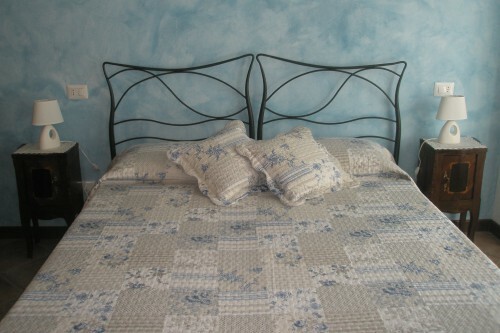 In the room you can add a baby cot to accommodate a child up to 3 y.o.